I am a C.S. Lewis fan, though I haven't read all of his books I loved what I have read. 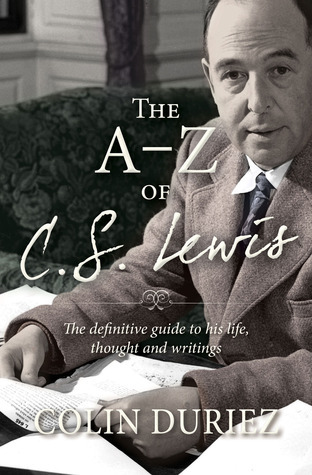 This book is basically a Lewis encyclopedia of his writings and life. I think this book would be a great companion while reading any of his books, it gives detail on every aspect of his books. It lists places and people in his books and explains the who, the what, the where, and the why. While this book was not what I was expecting it's a great book to have on hand! I recommend to anyone who is reading C.S. Lewis and to those who like details! Colin Duriez was for many years a commissioning editor at Inter-Varsity Press UK. He has subsequently appeared as a commentator on DVDs of Peter Jackson's The Lord of the Rings, and BBC television's The Worlds of Fantasy. He is also the author of The Inklings Handbook (with the late David Porter), J.R.R. Tolkien and C.S. Lewis: The Story of Their Friendship, and Tolkien and The Lord of the Rings, and has contributed to definitive reference works relating to Tolkien such as The Tolkien Encyclopedia (Routledge).